Veteran journalist and author Joseph C. Goulden offers a good review of Jason Mattews' spy thriller Palace of Treason in the Washington Times. Given the superb credentials of the author — a top CIA operative for 33 years — one is tempted (and with justification) to read this novel as a roman a clef, and especially in its depiction of the Russian criminal state assembled by President Vladimir Putin. One minor disappointment: Putin is on the verge of seducing a beautiful Russian counterintelligence officer who is also a CIA penetration agent, but must desist at the very last minute. No matter. Enough insider information is contained about the corrupt court of Putin — is it heresy to term him Vlad the Terrible? — to make one suspect that much of the material is based on reports from the agency’s Moscow station. One little secret about Langley is that our spies love trafficking in salacious gossip about foreign leaders that would not be out of place in the New York Post’s Page Six column. Jason Matthews was CIA chief in Moscow during a career spent mainly in the so-called “denied areas” subservient to the old Soviet Union. And his book has an authenticity seldom encountered in spy fiction. At the outset, cast aside uninformed Washington chatter about a “detente” among spies. Mr. Matthews depicts an intelligence battle in which the CIA and the Sluzhba Vneshney Razvedki (SVR), the Russian foreign intelligence service, successor to the late KGB, compete with Cold War fervor. 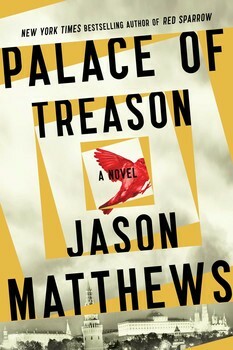 “Palace of Treason” features two central characters who Mr. Matthews introduced in his best-selling first novel, “Red Sparrow.” The luscious Capt. Dominika Egorova, is an SVR counterintelligence officer turned into a penetration agent by the CIA. (To start her career, she underwent “sparrow” training in the art of sexpionage, which is exactly what the name implies.) Her chief CIA handler — and lover — is Nate Nash. That they are lovers breaks the rules, of course, but such is Eros.